A written account by Dr. John Freeman, professor emeritus in physics and astronomy and director of Master of Liberal Studies. The idea sounded great: a chance to witness a total eclipse of the sun. The Houston Museum of Natural Science was organizing at trip to Cairns, Australia, to witness the last total eclipse of the sun visible from Earth until 2015. Thrown in for fun was time in Sydney, Australia, Christchurch and Queenstown, New Zealand, and a stop in Fiji on the way home. To get a good view of the eclipse, Carolyn Sumner from the museum had arranged for us all to have a top-floor hotel room with a balcony facing east. The eclipse would occur shortly after sunrise on November 14, 2012, just above a group of mountains to the east beyond a beautiful Coral Sea bay facing the city of Cairns. Alas, on the prescribed morning a group of clouds hung right above the mountains. As the sun rose and the moment of totality approached the clouds played peek-a-boo with the sun. I was able to get some photos of the partial phases going toward totality and coming out of totality, but during the two minutes when the moon completely hid the sun, it was all clouds. Sigh! Partial eclipse going toward totality hidden in the clouds. Partial eclipse coming out of totality. The trip was great fun anyway. Highlights included a wonderful few days in Sydney with a guided tour and ballet performance at the world famous Sydney Opera House. 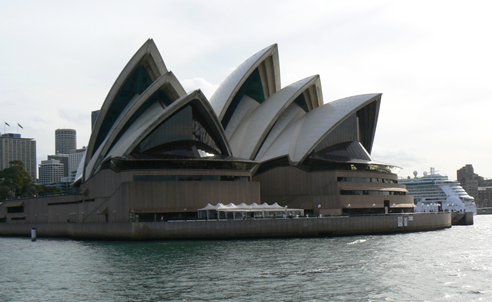 The Sydney Opera House is an astounding architectural wonder. The challenges involved in building it were enormous. The Sydney Opera House took 16 years to build and was 14 times over budget. Of course, no trip to Australia would be complete without diving or snorkeling in the Great Barrier Reef: beautiful fish and coral. In New Zealand the highlight was the incredible beauty of the mountains and the fjords. 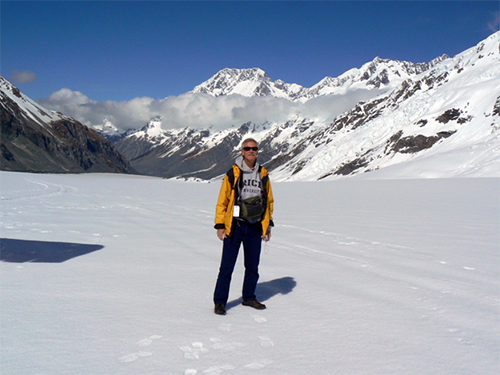 I had a chance to join a ski-plane flight that landed on a glacier on Mount Cook – a once in a lifetime experience. In New Zealand we saw more sheep than one can imagine – as well as demonstrations of how working sheep-dogs can control and corral the sheep with uncanny skill. We also saw demonstrations of sheep shearing. In case you have ever wondered, the world record for sheep shearing is about 600 sheep in one day by one person. Fiji was about the natural beauty of the South Sea Islands, and again the majestic coral reefs. After nine plane flights, one as long as 14 hours, endless airport lines, security searches and canceled flights it was good to be home and back to friends and the MLS program. The eclipse of 2015 will be visible from the U.S. – an easier trek! John: Thank you for sharing the details of your trip! May we all strive to live our lives as fully as you live yours. Carol, I couldn’t agree with you more!